UN chief Ban Ki-moon has demanded an immediate investigation into an air strike in Syria on Wednesday that hit a school, killing more than 20 children. "If deliberate, this attack may amount to a war crime," he said. Russia has said neither it nor Syria carried out the attack in the village of Hass in rebel-held Idlib. Syrian media and a monitoring group meanwhile say rebel fire killed several children at a school in government-held western Aleppo on Thursday. 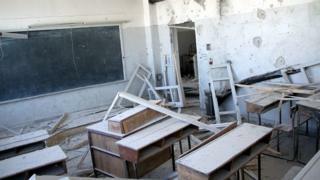 State news agency Sana said three children died when shells hit the school in the Shahaba area. The UK-based Syrian Observatory for Human Rights (SOHR) said six children were killed in both that incident and rebel shelling of the government-held district of Hamdaniya. It came as the UN warned that the coming winter could be the worst yet in Syria's five-year-long civil war. The head of the UN's humanitarian task force for Syria, Jan Egeland, said the brutal conflict had become "more ruthless" and was affecting increasing numbers of civilians, including children. Five Syrian schools, including the one in Idlib, have been targeted since 11 October, the UN's children's fund Unicef said. Emergency workers in Syria and the SOHR said on Thursday the death toll from the Idlib attack had risen to 35, and that most of the victims were children. It appears the bomb fell in the village, about 75km (45 miles) south-west of Aleppo, as children were getting ready to go home early because of air strikes. The BBC has not been able to independently verify the details of the attack. A spokesman for Russia's defence ministry, Maj Gen Igor Konashenkov, said the claim was a fabrication and that a Russian drone had found the school's roof still intact on Thursday. But the SOHR, which gathers information from a network of people within the country, said "warplanes - either Russian or Syrian" had carried out six air strikes on the village. Mr Ban said: "If such horrific acts persist despite global outrage, it is largely because their authors, whether in corridors of power or in insurgent redoubts, do not fear justice. Unicef chief Anthony Lake said the incident might be the deadliest attack on a school since the war began. "Children lost forever to their families, teachers lost forever to their students, one more scar on Syria's future - when will the world's revulsion at such barbarity be matched by insistence that this must stop?" As part of efforts by the UN, the people of eastern Aleppo are being offered safe passage to the province, the BBC's James Longman in Beirut says. But as these latest attacks demonstrate, he adds, nowhere in rebel-held Syria is free from violence.